Product prices and availability are accurate as of 2019-04-18 23:57:23 EDT and are subject to change. Any price and availability information displayed on http://www.amazon.com/ at the time of purchase will apply to the purchase of this product. Crafting, art, and helping in the kitchen is fun, but sometimes gets messy! Don't let your sweet girl ruin her fun by ruining her clothes. She needs this fun and functional apron. 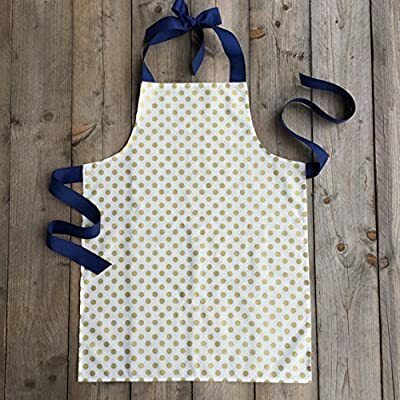 Our 100% cotton apron features a shimmery gold polka dot print and generous dark blue grosgrain ribbon ties at the neck and waist. It's lightweight and easy to wear. It's also machine washable for easy care. We recommend washing in cold water and drying on low heat. Perfect for cooking or crafting! Sized for tween and teen girls (ages 7+), finished width is approximately 21 inches, length approximately 27 inches. Girls love this comfortable apron! The generous ties at neck and waist (each approximately 23") will allow this to fit your girl comfortably and will adjust with her growth. To see more of our handmade products, please click on our shop name or logo.